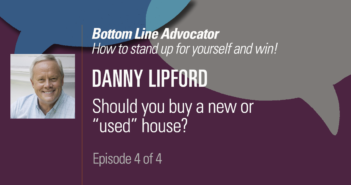 In this episode of The Bottom Line Advocator, Emmy Award–nominated and nationally syndicated television personality Danny Lipford joins Bottom Line Inc president Sarah Hiner to discuss the age-old question of whether you should buy a new or an older home. What are the trade-offs? What are the benefits of each? And what should you beware of? Listen in as Danny breaks down the home-buying decision step by step.